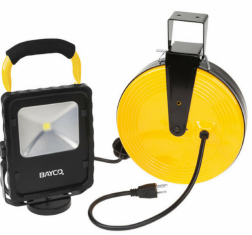 Bayco Products, Inc, a provider of tough, durable and affordable lighting since 1984 announces the Bayco model SL-868, a powerful corded LED work light with portability and functionality benefits. Automotive professionals and other users will be able extend its 40-foot heavy-duty 18/3 SJT retractable cord and attach the rare-earth magnetic base to most metal surfaces. Once in place, the light can tilt and swivel in limitless directions until a specific work area is perfectly illuminated. A single switch activates the 950-lumen floodlight that emits from a long-life 10W LED. It’s built with a tempered glass lens and features a powder-coated aluminum finish for maximum durability. The SL-868 is available now and is backed by a 1-year limited warranty. For more information, visit www.mybayco.com.